I have taken to liking fish tacos ever since I had one in Mexico from a beach-side shack. Nothing exotic or fancy that I found this taco,but it had an immense comfort food feeling and I had made up my mind that I would try at home. It turned down just as tasty. 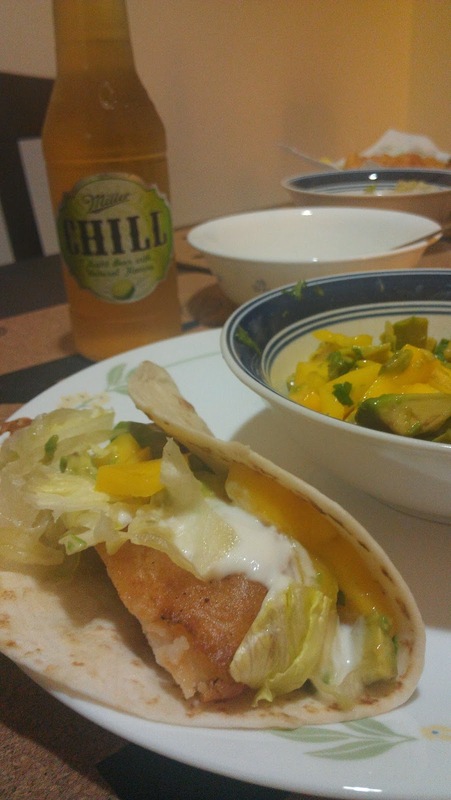 I for sure will be trying more fish taco recipes in the months to come!!! Mix the batter mix with beer,salt and pepper and let it stand for 5 mins. If the batter seems runny add more batter mix to thicken. In the meantime, dredge the fish in the flour so that when it is dipped in the batter the fish gets well coated before it is deep fried. Keep the fish aside. Heat the oil on medium heat. Just sprinkle some flour in the oil and if the oil is heated well enough the flour will just spread out. At this moment take the fish and dip it in the batter mixture and deep fry in the oil for about 3 mins on each side or until golden brown. Place the fish on the tissue to drain excess oil. In a bowl mix mangoes, 2 tbsp of lemon juice,chilies, avocado and cilantro. Toss well and refrigerate until time to assemble tacos. Mix the mayonnaise and 1 tbsp of lemon juice. Whisk the mixture to a sauce consistency. Keep it aside. Refrigerate the shredded cabbage until time to assemble the tacos. Take a corn tortilla,place the fried fish and top it with salsa, sauce and the shredded cabbage. Serve with chilled beer and experience the warmth of comfort food at home.